Texting and driving is a big no-no. We get that. People still do it, but it isn't from the misguided belief that they aren't being risky or, in some places, breaking the law. Yet what about texting and walking? It may not result in unintentional manslaughter (okay, it's much less likely to result in accidental death), but that doesn't mean it's harmless. 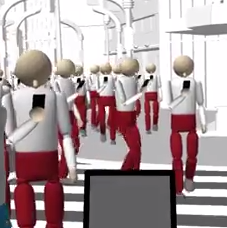 In Japan, wireless carrier NTT Docomo has been trying to educate the public on the dangers of walking while having their eyes glued on a mobile device. In typical Japanese fashion, the company's doing so in an adorable, somewhat humorous fashion. The company collaborated with Aichi University of Technology to create the simulation shown above. The software depicts 1,500 people walking through Shibuya Crossing in Tokyo all while looking at their phones. Crosswalks go ignored, walking paths are cut off, and people move about in inefficient patterns. Safety aside, it looks like a situation that would drive a city planner bonkers. In short, be considerate. Don't text and walk.